It is hard to believe today, but on August 30, 1799 a joined force of British and Russian soldiers defeated the entire Dutch fleet and invaded a part of Holland. Eventually, they had to give up and were allowed to leave the country unmolested. Now how did the Dutch chart look that day? When a war or a battle is concerned, I always look for Mars-Eris combinations as Mars is the symbol of war and competing, while Eris is the goddess of disharmony. I use to find that combination. Transit Mars in the 12th degree of Virgo was inconjunct natal Eris, which is a perfect statement for a lost war incident. Transit Eris was inconjunct natal IC (and Saturn inconjunct natal DC). 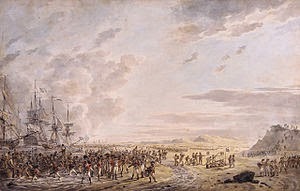 On October 6 (Battle of Castricum) ended in the unharmed retreat of the British-Russian army, shortly after transit Venus was trine the Dutch MC. Venus is for peace and kindness. Edith Wangemann was born August 29, 1917 in Germany. Together with her husband, and after his death alone, she practiced and studied astrology. She was married to an astrologer (Helmuth Wangemann). A picture shows that he knew Reinhold Ebertin. I have no idea how they made a living. Astro.com mentions the couple's scientific approach. In her chart this might be mirrored by the position of their Saturn, rising before the natal Sun. This post is about the astrologer in her chart and about the way that Sun in Virgo shows up. Cosmic awareness is perhaps one of the best descriptions for Jupiter/Uranus midpoints and aspects. This aspect- or midpoint combination for the helicopter view is always present in the charts of astrologers (and astronauts). Maybe even also in the charts of astronomers, LOL. There is also a Jupiter/Uranus connection in the chart of Edith Wangemann. In the chart of Edith Wangemann midpoint Jupiter/Uranus is square Midheaven. The natal Sun is square Jupiter in Gemini*) and in quindecile (165d) aspect with the 'calling' VIP Uranus. Her Sun/Moon midpoint semi square Mercury indicates that she was very motivated to communicate about her main interest (astrology). BTW, her husband was an Aquarius with Sun square Jupiter and sextile ruler Uranus. Now, in what way did she practice being a Virgo? *) She particularly studied the charts of twins. Gemini is the sign of twins. The chart of Pope Francis was hit today by ruler 8 Uranus (opposite Ascendant) and the natural ruler 8 Pluto conjunct ruler 3 Mercury. In the progressed chart MC and Mercury are square now. This picture of the sky accompanies bad news (see ABC http://www.abc.net.au/news/2014-08-19/three-pope-francis-relatives-killed-in-car-crash/5682610 ). Family members died in a car accident in Argentina. The 8th house is the symbol of crisis, life-and-death moments and changes (definite ones). Uranus' transits may be shocking. Pluto refers to stress, problems and challenges. The combination of Uranus and Pluto is often the symbol of crisis. Mercury and the 3rd and 6th house are related to relatives like brothers and sisters, nephews and cousins, aunts and uncles. Mercury is also the symbol of traffic and communications. It seems that those 3 actual aspects picture the situation, but like in every case: it's not so vice versa and there need not be a death in the family just because of those particular transits and houses. That is because the astrological vocabulary has a range of words and meanings for every single symbol. The 8th house is also the house of your partner's money, for example. A Huffington Post message made me have a look at the chart of the victim of a shot, probably not meant for him. The chart of the day of birth has Sun inconjunct Mars. That is a difficult aspect when it comes to fire, shooting, fighting, competition and aggression*). Astrology fails to tell us 'who done it'. Victim and killer can have the same kind of aspects, as I showed you before, related to Mars-Pluto ( http://astropost.blogspot.nl/2008/04/mars-in-aspect-with-pluto.html ). In this case there is also a Mars-Pluto aspect. The progressed chart of the victim has progressed Mars quindecile natal Pluto (focus on danger). On his birthday Mars was exactly sextile Pluto. (For the correspondence between natal, progressed and daily aspects see the post on Resonance). I'll focus on progressed Sun conjunct Ixion. Ixion is the object that I already mention today (re the synastry of Jackie and Jaycee Chan). 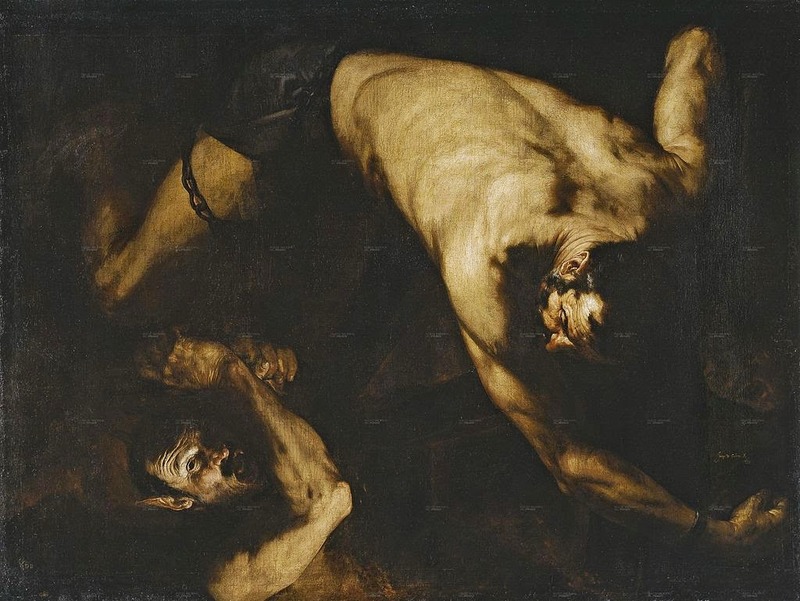 Ixion is the symbol of the ungrateful guest/dog, bad hosts and the 'bad guy'. When you are being confronted with Ixion, you'd better watch out. This man couldn't watch out. He was playing a computer game when the bullet hit him, just hours after celebrating his birthday (with guests?). If you were born on the same day and in a dangerous neighborhood or country, take care! Of course it makes a difference who you are and where you are and ... what other transits and progressions there are in your chart. Thousands of people were born on the same day (and will die on another day!). The astrological mirror has different colors and different views for all the differences in way of living, genes, gender, status and position. PS Transit Uranus in the 17th (16-17!) degree of Aries is about to make an opposition with my natal Ixion and the Ixion of almost everybody born when I was born. Perhaps my generation will be shocked when somebody surprisingly turns out to be a 'bad guy'? Sometimes horoscopes seem to mirror exactly what happens on earth. Watch the chart of Jackie Chan today, now that his son Jaycee is in jail. Transits of Saturn really force you to face nasty facts...This transit isn't good for your career or reputation or... for family matters (the square also hits the IC). Jaycee Chan's progressed Sun is conjunct transit Pluto, definitely a symbol of stress and danger. The Ixion of Jaylee inconjunct the natal Sun of father Jackie reminds me of the post on Ixion (http://astropost.blogspot.nl/2014/03/what-is-ixion-lets-test-it.html ) where I wonder if the range of meanings include the bad guy, the ungrateful dog and the 'bad guy without moral' only. Apparently at some point in their joined lives, a moral matter had to stand between them. 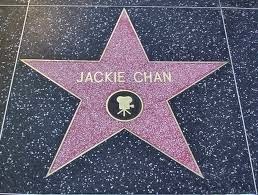 In 2012 Jackie Chan told the press that Jaylee would be left out of his will, because he would only waste the money that he earned. The drug in question is a soft drug: marihuana. But in China the police is trying to get a hold on the use of drugs among artists, now. The sentences are even harder than in the USA. It must be a nasty period for Jackie Chan now...even though he already had problems with his son's life style. BTW Jaycee was born December 3, 1982. Yesterday I watched the comedy 'Hysteria'. One of the characters was a phrenologist. A what?? ?Google and Wikipedia helped me on the way. Now I found the date of birth of Franz Joseph Gall, the first phrenologist. 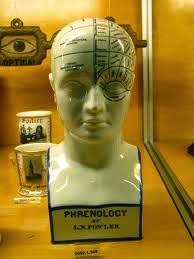 Phrenology was considered a science and part of psychology. By examining the head the phrenologist could tell the character (and future) of someone. Bump feeling, yes? That is amazing, isn't it? On this blog you find a number of examples of astrologers with either Jupiter/Uranus midpoint-Sun combinations or aspects of the Sun with Jupiter AND Uranus or ...well: with Jupiter and Uranus, the symbols of the helicopter view, helping them to get involved in astrology. Now I found the date of birth of Franz Joseph Gall, the first phrenologist. 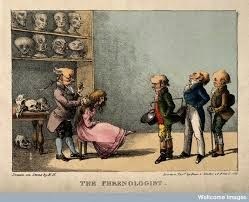 Phrenology was considered a science and part of psychology. By examining the head the phrenologist could tell the character (and future) of someone. That is amazing, isn't it? Jupiter/Uranus is inventive. So was Franz Joseph Gall, I presume. Here is the chart of the day that he was born. 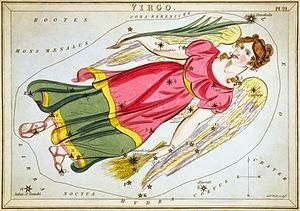 1. when the progressed Sun had entered the final degree of Virgo (about to change sign). It means that life or lifestyle is about to change. The period before and just after the changing sign of the progressed sun is an unstable period. In the natal chart Mars is rising before the Sun. It is a position for an activist, for a do-er, for someone who is not likely to sit back and wait for the good times. 4. when the retrograding transit Pluto had been (again) opposition natal Mars and Uranus (and was on the midpoint Mars/Uranus); the Mars-Uranus-Pluto combination is about crisis. 5. with progressed Ascendant semi square the natal Sun/Moon midpoint and highlighted his situation. 6. when progressed Mercury ruler 8 was moving to an inconjunct with Jupiter. Mercury-Jupiter is the combination of successful decisions, but an inconjunct in between speaks of lost balance and loss. 10. The important transit of Saturn had been over his Ascendant and was in the first natal house. Transits of Saturn are often depressing and force you to face the facts of life. Also, the solar return chart for Chicago (place of birth) has Saturn on Midheaven. It might just be coincidence, of course. On important moments in life, we use to see a lot of transits and progressions. The list above shows the amount of them on August 11, 2014. At least 5 of the above mentioned points are related to the 8th house of death, but still this wouldn't have to mirror the end of life. Astrology, like statistics, doesn't work the other way around. And it takes a natal chart to start with. 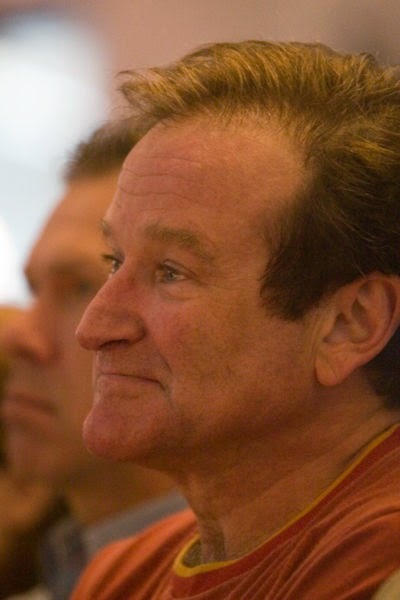 Robin Williams' natal chart has an usual pattern of artistic talent compared to the artists on my site Art&Astrology. The sensitive and amorphous Moon in Pisces opposition the planet of art, Venus is in a way (as Pisces is the 'house sign' of Neptune) a variation on the theme Moon-Venus-Neptune. Leo MC is for the star. The culminating Mercury tells us about the importance of communications. He 'quickly mastered dialects', says Wikipedia and Mercury's prominence mirrors that. Mars rising before the Sun and Out of Bounds is in line with the fact that he was called 'hyperactive' when he was young. The inconjunct of Sun and Chiron shows us that there is something wrong and healing was needed (from the start). Here is the chart with transits and progressions for yesterday. Sorry to have to tell you that my website Astromarkt (Astropost's 'mother' site) has been hacked. One thousand spam mails were sent before the provider shut it all down. For security reasons the site won't be available until the upgrade/repair and that might just take a while. Thanks to the abusers of my site! Nice birthday present (it will be the 11th year of Astromarkt starting August 12)! Maybe a sign for a change (progressed Sun Astromarkt just changed sign? Or just on holiday? Follow Twitter or see the Facebook page of Astromarkt for a follow up! I recall that I was on a parking place when I noticed a strange sort of cloud in front of the Moon. It was earth. Nobody else was looking up. Everybody was busy eating, drinking, stretching or minding the children. How many people in the world will be looking up and see any difference in the seize of the moon tonight? I wonder if the "Super Moon" will shine on that mountain in Iraq, too. How many people will watch Super Moon in Syria, Gaza, Ukraine or Israel? Does it help them to know the chart of today? I wonder... Perhaps that is because the super moon is in my 12th house. Or it is because there are too many clouds to be able to see any moon at all. And: the moon isn't SUPERB at all (see: http://m.space.com/26782-is-sunday-s-supermoon-full-moon-really-that-super.html ) This is the chart of Super Moon. Inconjuncts mirror a state of imbalance with the risk of having to give up or losing. More than 2 of them in a chart don't contribute to stability and pleasure. Astrology is like meteorology. There is a weather report and depending on your position and situation the weather is either good or bad. Apparently, being in the Middle East right now is not being in a good situation. Those inconjuncts don't help. It is a situation with a sliding scale, but the chart won't tell who wins and who dies. It is simply pointing at unstable weather with losses involved. For those born on the 9 or 10th of February, May, July or November, this full moon promises personal change in the next 14 days. It depends on where and who you are, what kind of change it will be. I hope it is a good one!